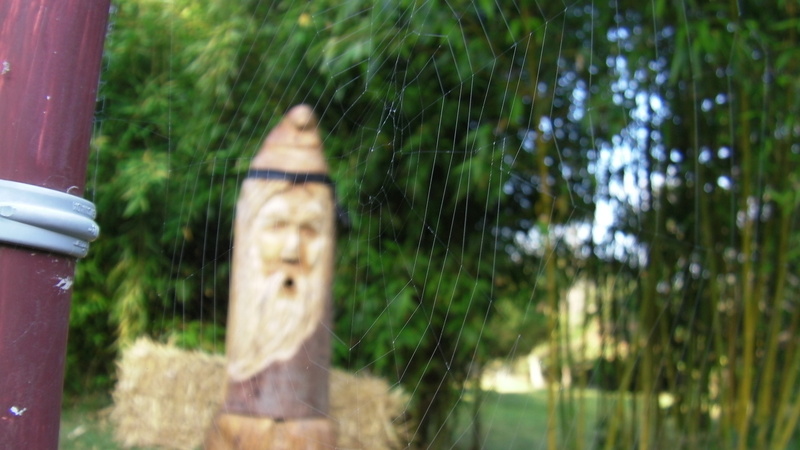 When I first saw the insect in this web, I thought it was one of my bees because it’s in the flight path to the Bee Beard Log Hive. I was much relieved when I realized it was a wasp. Over the next few days of checking her web I was able to capture some very close up video of “Fang” wrapping her victims and injecting them with her venom. Here’s a creepy video accompanied by some creepy music provided by my brother, Elliott. 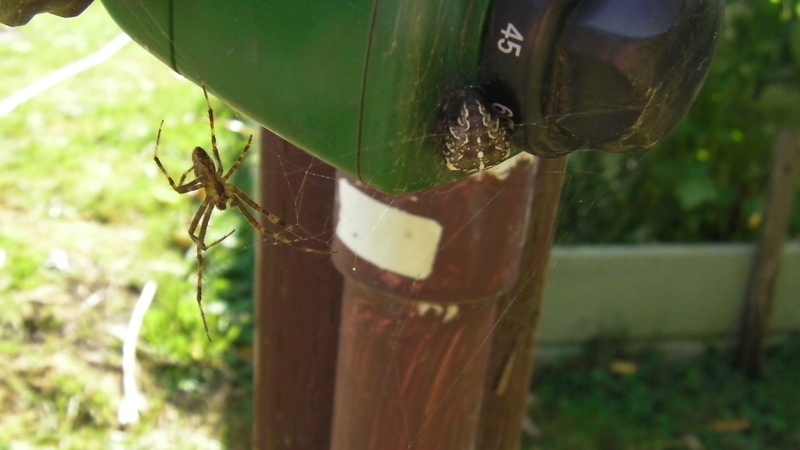 If you hate wasps, you’ll love this video…if you hate spiders, you’ll be happy they are smaller than we are. Hmmmm…I wonder what the male is up to. Waffling over the Warre…To Feed or Not to Feed? Back in February, I listened to a podcast interview with Matt Reed of Beethinking.com. He talked about the Warre Hive. Now I didn’t really want to get into another type of hive, but it sounded so intriguing and easy to use, I decided to give it a try. I liked the idea that the boxes stacked in a vertical orientation, mimicking a hollow tree. It sounded like the most ‘natural’ type of hive that wasn’t actually a tree. 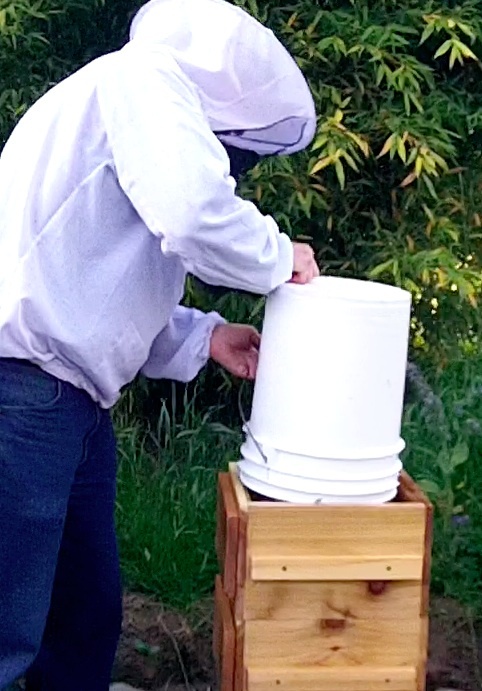 I also liked Matt’s approach of not using any chemicals inside his hives. So I ordered a kit with observation windows and a screened bottom in case I wanted to do a mite count. I didn’t want to order package bees because they might not be acclimated to the wet area we have on the Oregon Coast. I had passed up the ordering date and was nervously waiting for my bait hives to catch a swarm, but nothing was happening. 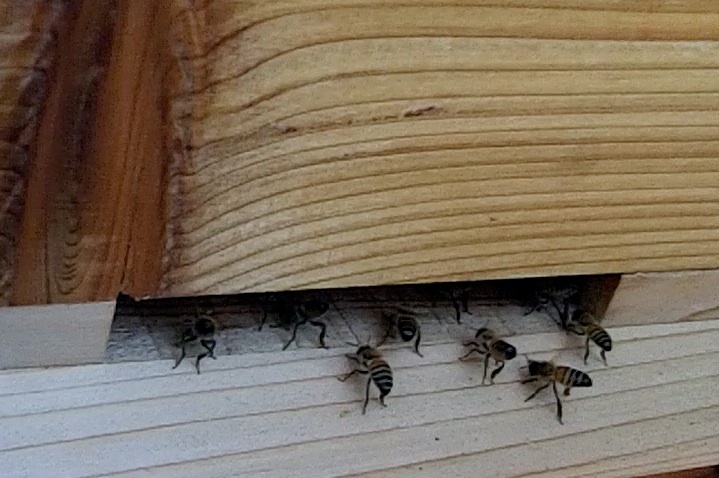 Then I got the call about a swarm that had just formed about an hour ago. I threw everything into the car and was on my way. 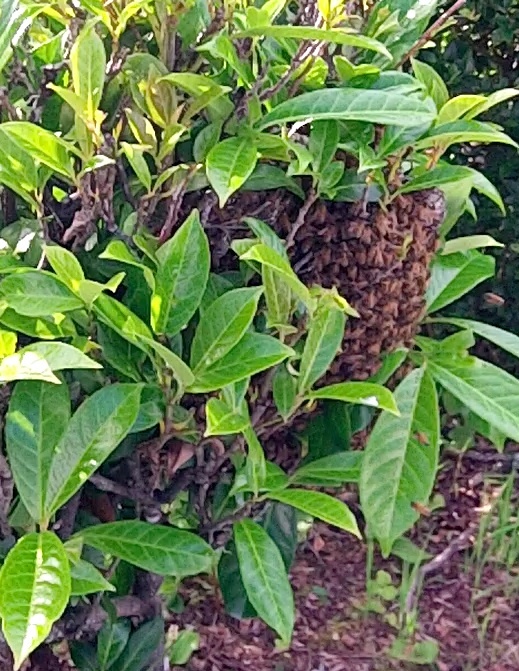 A Swarm in a Bush…A made-in-heaven low swarm for my first experience. 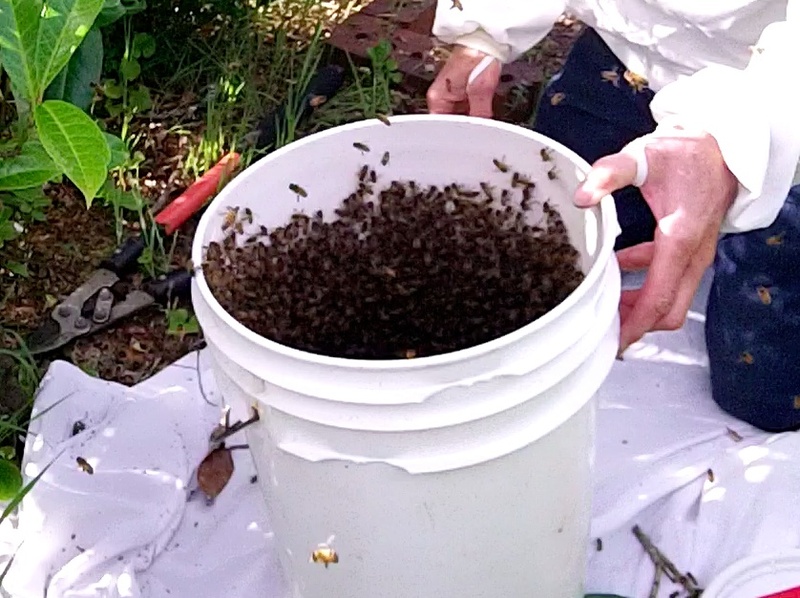 A Swarm in a Bucket…I was able to cut branches and shake most of the bees into this 5 gallon bucket. A Swarm in the Warre Transferring the swarm into the Warre was easy…tap the bucket on the ground once or twice, then pour into the hive. I replaced the bars on top, installed the quilt box and the roof. Did I get the queen? 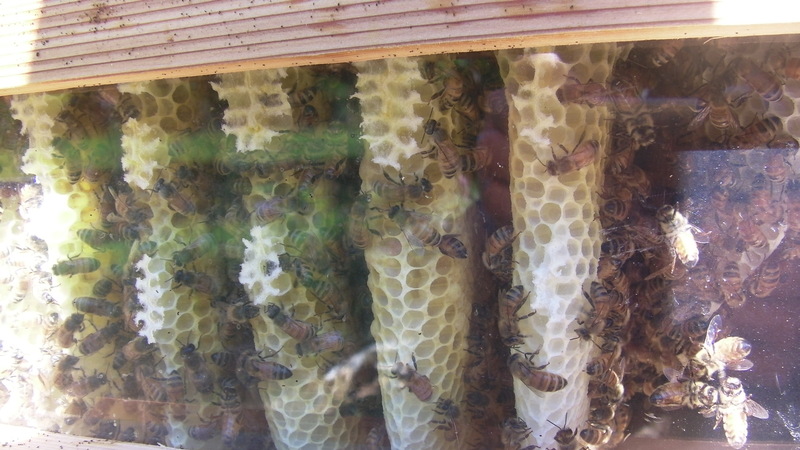 Bees can be seen fanning the pheramone that the queen is ‘in the building’! July 7, 2012 This shows how much natural comb they built in about 5 weeks. I wonder when they will start on the bottom box. I anxiously wait. The bees don’t build into the bottom box. I consult the forums where suggestions are made to add an empty box overhead. 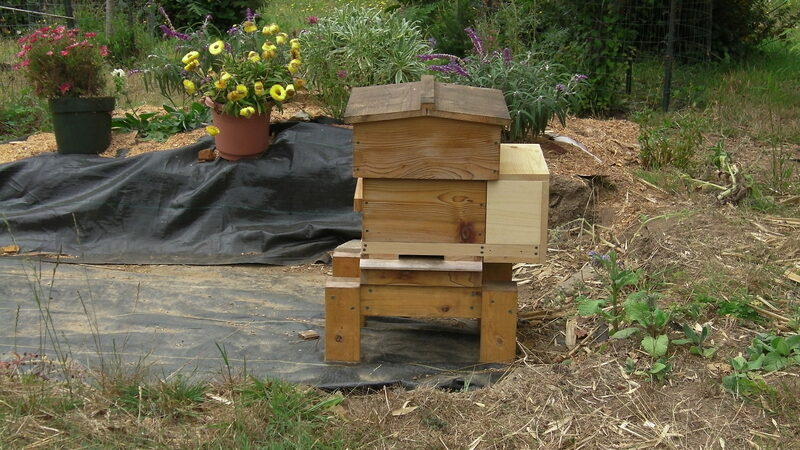 “The bees don’t like having an empty space over them.” On July 23, 2012, I add a third box, this time on top. 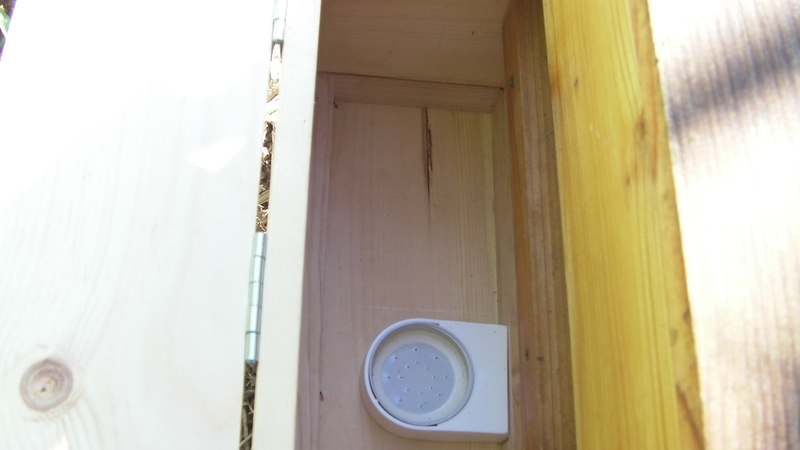 After I drilled a 3/4″ hole for the bees in the top box, I waxed up some top bars and put the whole thing in place. July 24, 2012. I like this…I can get a view through the observation window looking down at the occupied middle box or up to the top bars in the top box. August 3, 2012 A view of the comb in the middle box…still no building in the top or bottom box. August 20,2012 Looking into the Warre, plenty of bees, plenty of honey,..but they are STILL not building any comb in either the top or bottom box. 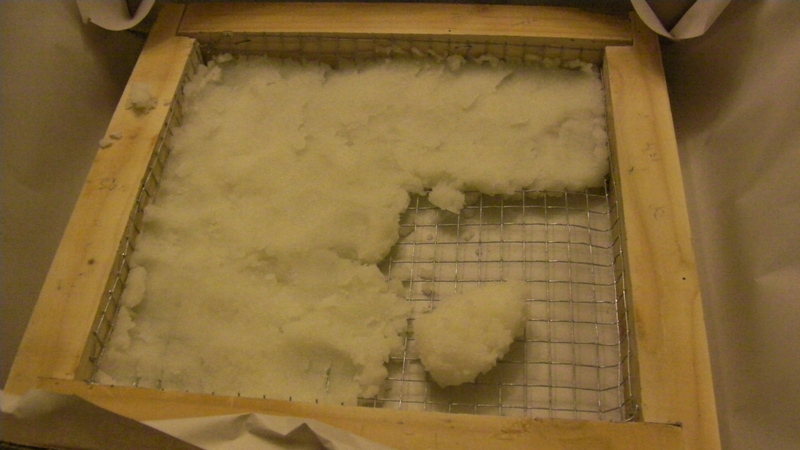 I consult the forums…”can a Warre get through the winter on only one box?” It’s getting late in the summer and my efforts to get them to build either on top or in the bottom box have been fruitless. The answers seem to imply I’m a reckless beekeeper if I don’t consider feeding them. After looking at the forums, I found the answer. 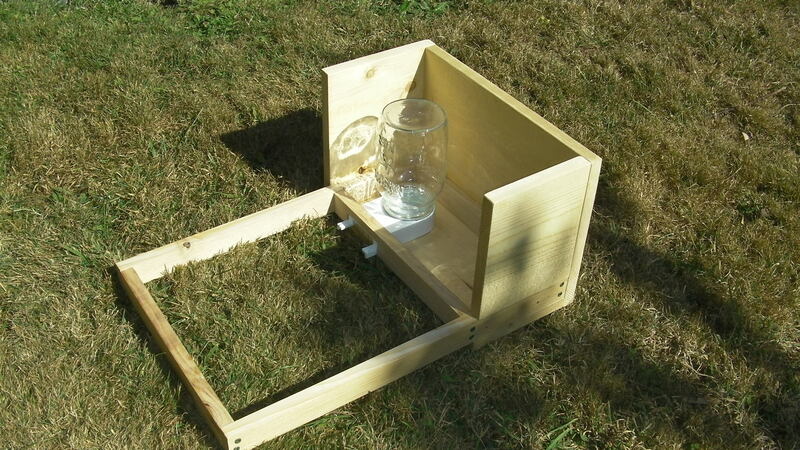 Build a feeder that is accessible from the outside. 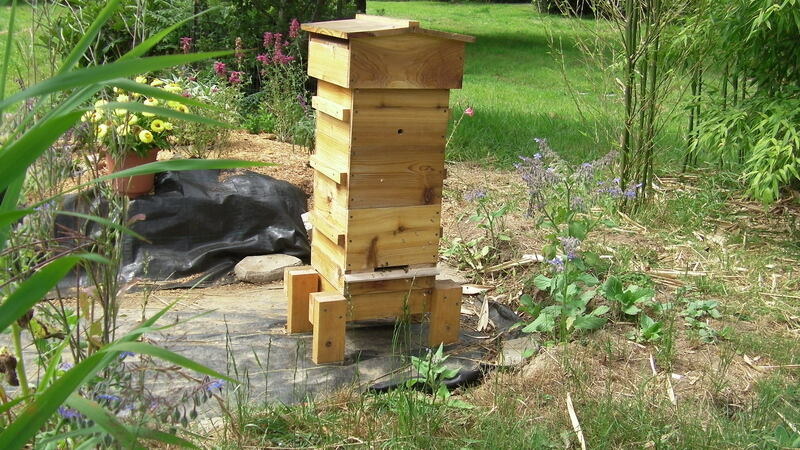 If it becomes necessary to feed the bees I can do it without opening the hive up to the cold air. 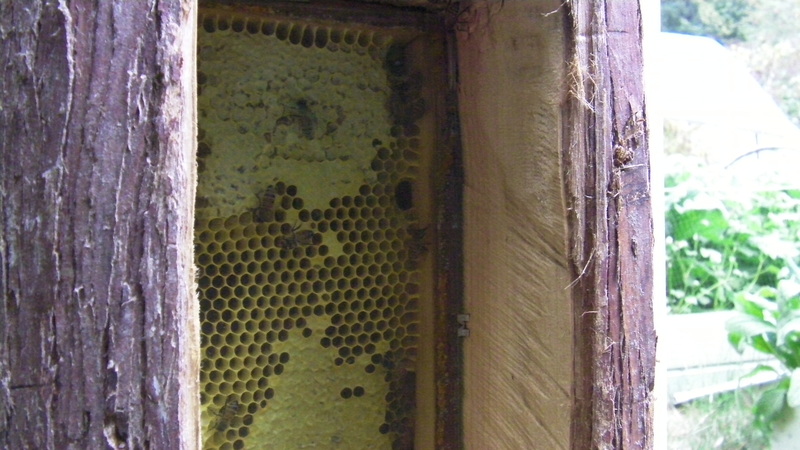 The hive is kept intact with no extra holes drilled into it for the sugar water. I want to thank Colobeekeep for providing photos of how he built this. Lid open, no jar yet. 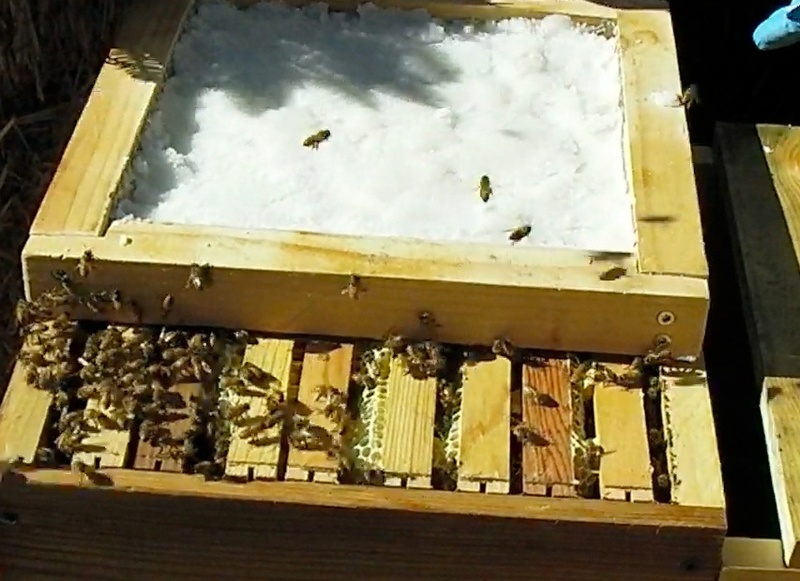 Bees can access the sugar water, but not the feeder box. Bottle can be changed without opening the hive. It’s placed near the rear of the hive to discourage robbing. I really DON’T want to resort to feeding them. From what I read, sugar raises the pH of the hive making it more susceptible to Nosema, but I also don’t want to lose this little hive. I definitely won’t use High Fructose Corn Syrup because it is made from GM corn which is treated with clothianidin, a systemic insecticide highly toxic to bees. I’ll pay close attention to the honey stores by looking through the observation window. If they get low I’ll be able to supply either 1:1 or 1:2 sugar water without opening the hive. 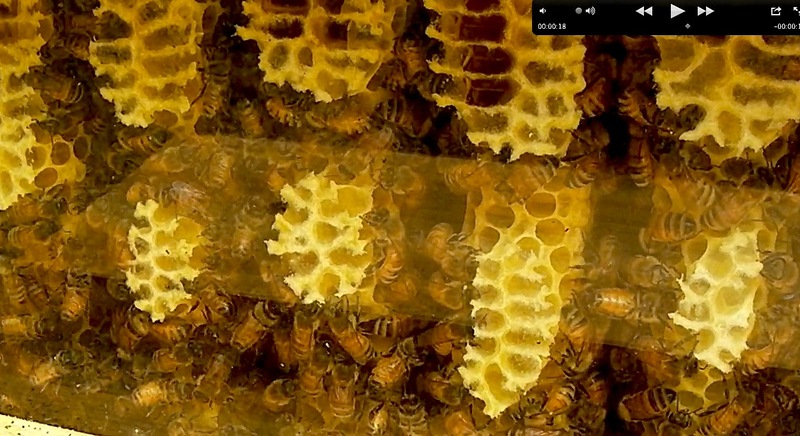 This short video looks into the Warre hive through the observation window (slight reflection issues) to see waggle dancing and daisy-chaining. 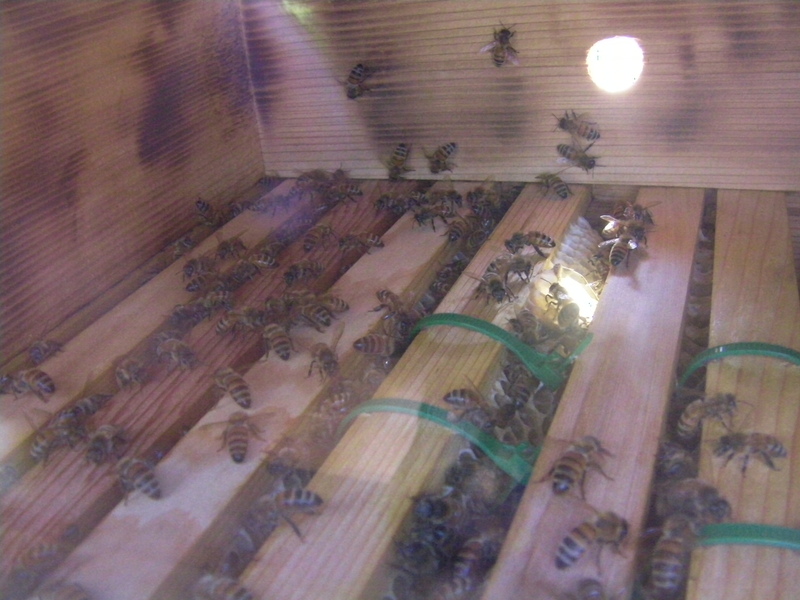 The last frame shows the natural comb built as a result of the daisy-chain. More Waffling…After going to the work of building the ‘side feeder,’ I observed the comments made about moisture in the hive. Well, I’m not going to say we live in a rain forest, but we do get buckets in the winter time. Should I worry about the moisture issues…yes. Okay, I’ll build an over-the-top ‘dry sugar’ feed frame. 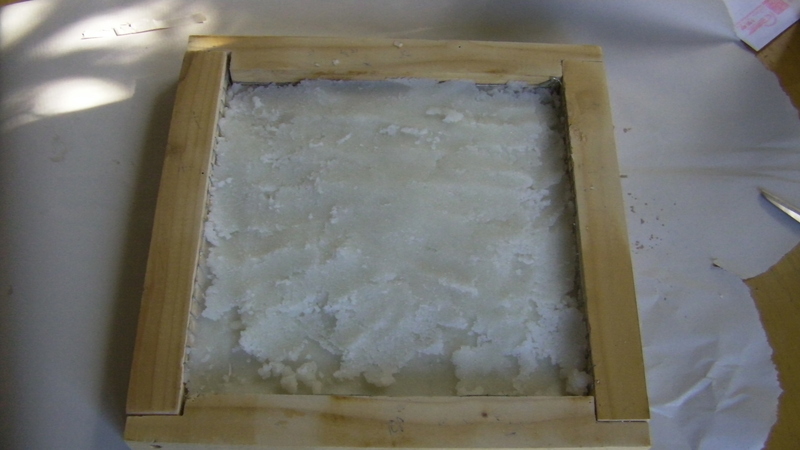 This shows the sugar resting on the 1/2″ hardware cloth. After this photo was taken, I dumped out the sugar and inserted a layer of blank newsprint between the sugar and the wire. That should hold up the sugar so it won’t drop down into the hive…I hope. Installing sugar feeder Oct. 25, 2012. This will let the bees go upward to access the sugar from within the cluster. Quilt box goes on top. Then I wrapped with red tape to seal the cracks. 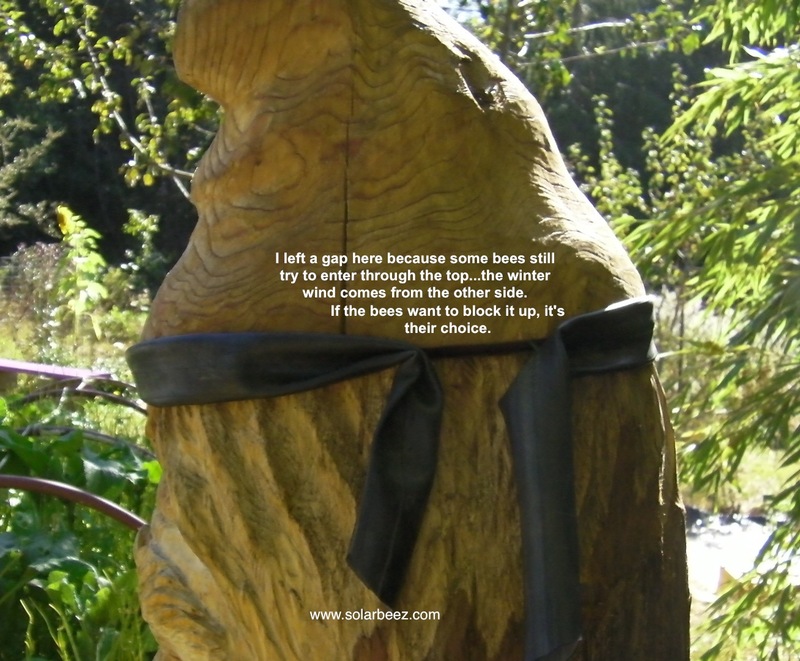 In anticipation of the wet stormy weather that the Oregon Coast is known for, I closed up some gaps on the log hive with a bicycle inner tube. Bee Beard gets a headband to protect against the cold winter winds. Bee Beard as seen through the observation window 10-8-12. 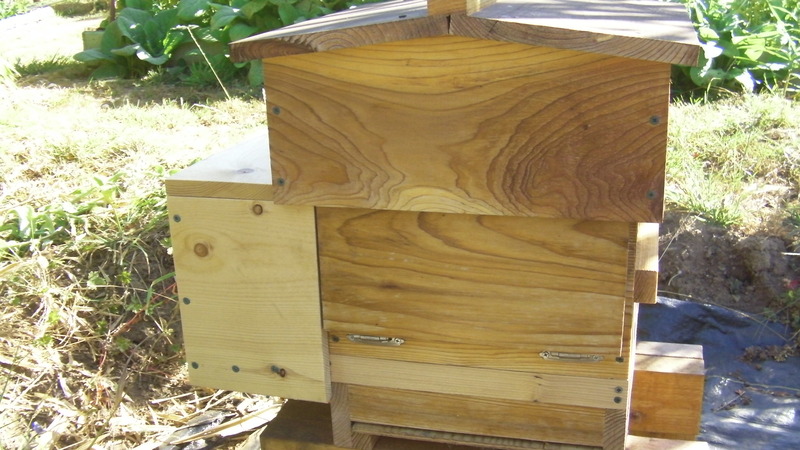 Bee-built tunnels provide access to the honey. The large number of unfilled cells is a concern, but the bees are still packing pollen, so hopefully they will get filled with something. 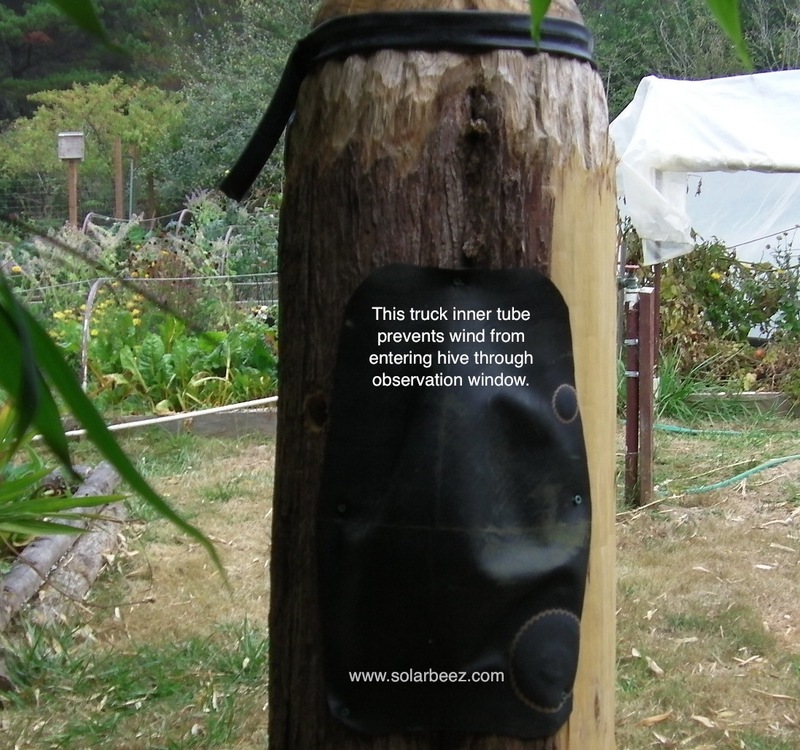 This truck inner tube covers the gaps in the ‘wood plug’ that covers the observation window. It’s removable so I’ll be able to look through the window from time to time. This log hive has exceeded my expectations for the summer. It has built up fast, didn’t swarm like my hive last year, (swarmed two months after I got it), and has out performed the Warre hive even though I got it going about the same time. Now for the real test…will it make it through the winter? I haven’t taken any honey from it, I’m not going to medicate or hang miticides, and I’m not going to feed it. It came from a natural living tree hive and made it through the winter last year without intervention so I feel it has a good chance. The only intervention I have given it is to peer through the window from time to time. If I get a swarm from it next year, I’ll count it as a success. 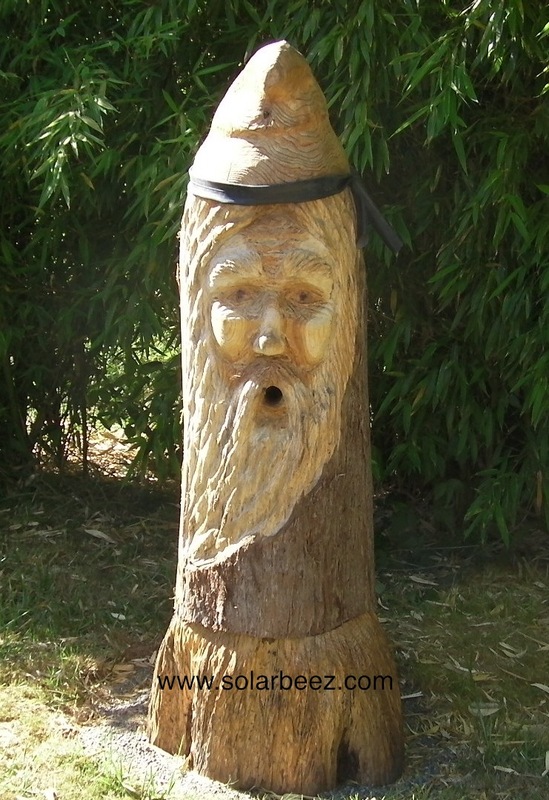 Maybe I’ll have my next log hive set up in time.